24 HOUR DRAINAGE, PLUMBING AND BUILDING MAINTENANCE SOLUTIONS FOR DOMESTIC AND COMMERCIAL CLIENTS THROUGHOUT PRESTON AND THE NORTH WEST. Established since 2009 with a dedicated team, who combined have over 80 years of industry knowledge and experience, assist the company in fulfilling its aim. “Our aim is to bring a fresh and highly professional standard to the industry across the North West and ensuring we provide our clients with 24 hour solutions”. 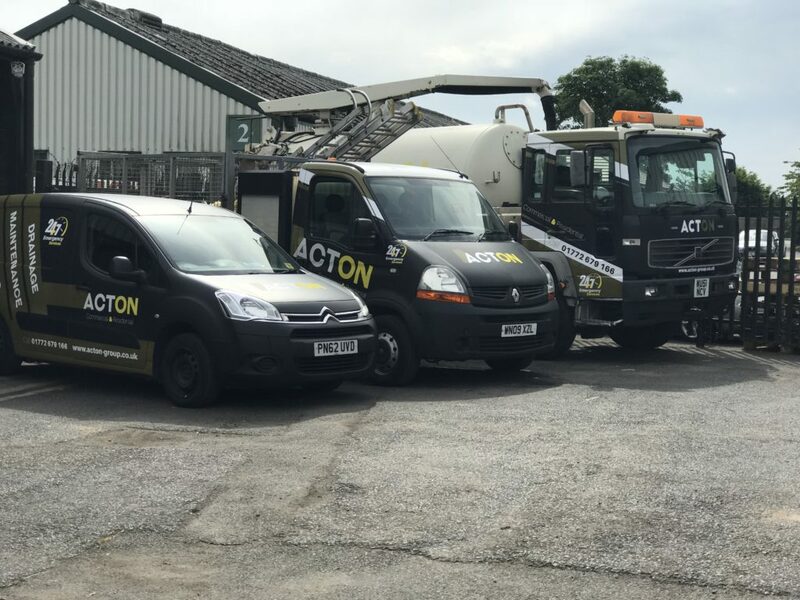 Acton Drainage Ltd is a leading drainage specialist, bringing a fresh and highly professional standard to all aspects of drainage and plumbing; ideally located to provide a fast and efficient service throughout the North West, across commercial and domestic sectors. Our 24hr, 365 days a year emergency service ensures there is always an engineer available, in any emergency. We offer a wide range of services and are proud to introduce our new special operations unit housing the latest crawler camera system for all CCTV Survey requirements, including homeowner’s surveys. We pride ourselves in being different from our local competitors, as we have our fleet of Jet Vac Tankers; offering a whole package to all our customers. Our aim is to provide our customers with a competitive, quality, safe and environmentally friendly service, with the objective of giving complete customers satisfaction, without hidden charges. We are proud members of SMAS, CSCS, are Water Industry and Homeserve Approved Contractors and Registered Waste Carriers. Our areas of operation cover: Cumbria, Lancashire, Merseyside, Greater Manchester, West Yorkshire and North Staffordshire. Acton invests heavily in the training of all engineers, ensuring they are expertly trained and fully CRB Checked. Our extensive fleet of vehicles and latest equipment ensures an efficient and professional service. We provide a quality review of all jobs under taken, including customer feedback to ensure the work is completed on time and to the highest standard.